Express Bus Agencies Association (EBAA) was formed in 2003 by a group of express bus operators and is registered with the Registry of Societies (ROS). Our registration number is T03SS0145C. The name of the association has been changed to Express & Excursion Bus Association in short EEBA effective from 23rd November 2013. The gazette notification effecting the change was published in the Government Gazette, Electronic Edition on 19th December 2013 vide Notification Number 3329. The main objective of the name change is to encourage and recruit more members and in particular, the excursion bus operators. The association has in place a constitution with the office bearers appointed once every two years. Currently the association has 41 members comprising mainly the tour & travel related agencies and express bus operators. Of these, 16 are ordinary members and 25 others are associate members related to the industry. EEBA ordinary members are mainly express bus operators providing land transportation for passengers traveling to Malaysia and even up to Hatyai, Thailand. Most of our express bus operators provide air-conditioned coach services to Malaysia and are equipped with electronic snoozer seat and personal entertainment system to pamper you right from the start of your journey to your destination. For peace of mind, do logon to our members website for special promotion and tour packages and be assured of our friendly staffs to cater to your traveling needs. To promote and foster cooperation, understanding between Members. To act as arbitrators or to assist in the settlement of disputes, problems and difficulties arising between Members. To make recommendations to the relevant authorities or bodies in relation to any measure which may involve its members. To offer assistance and advice to any interested bodies in connection with the express & excursion bus matters. Out of the 26.76 million tourists who travelled to Malaysia from January to December 2016, 13.27 million or 49.6% are from Singapore (an increase of 2.6% over the same period in 2015). Out of this 49.6%, an estimated 30% or close to 3.98 million visitors travelled to Malaysia by self-drive, express buses or excursion coaches. This figure shows that tourist arrivals from Singapore to Malaysia for the period of January to December 2016 average more than a million per month. In addition, inbound passengers from Malaysia including workers and tourists on transit traveling by coaches to Singapore are estimated to be 1.5 million. While we see tourism as an economic driver in our economy, the state of the tour bus industry is facing a transformation in improving its services and projecting itself as a key land transport provider for travelers to Malaysia and beyond. EEBA organise consumer travel fairs to Malaysia through our annual edition of Travel Malaysia with the support from Tourism Malaysia as the Title Sponsor. 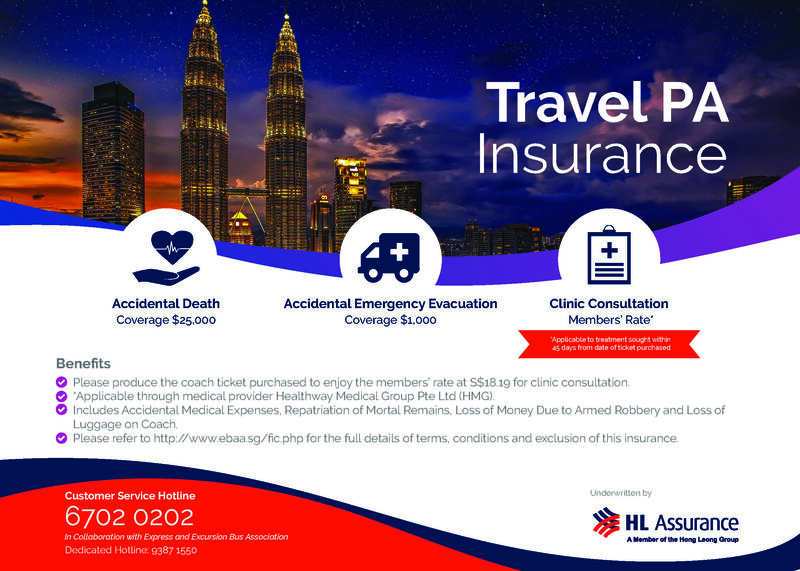 Main sponsor includes bank and insurance company together with key players from the express bus operators and those from the hotels and resorts operators from Malaysia. “Travel Malaysia” event has become a household name in Singapore and is always the most comprehensive tourism exhibition on Malaysia as a holiday destination. Visitors at the fair can looked forward to a wide range and unique mélange of attractions and holiday packages, as well as the multitude of special products and services offered by the major players in the tour and travel industries.